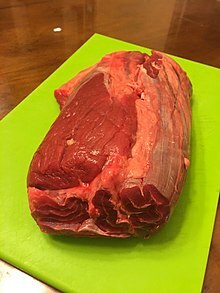 This article is about the beef cut. For other uses, see Tenderloin (disambiguation). The beef shank is the leg portion of a steer or heifer. In Britain, the corresponding cuts of beef are the shin (the foreshank), and the leg (the hindshank). Due to the constant use of this muscle by the animal, it tends to be tough, dry, and sinewy, so is best when cooked for a long time in moist heat. It is an ideal cut to use for beef bourguignon. As it is very lean, it is widely used to prepare very low-fat ground beef. Due to its lack of sales, it is not often seen in shops. However, if found in retail, it is very cheap and a low-cost ingredient for beef stock. Beef shank is a common ingredient in soups. In Australia, it is commonly sold from butchers as gravy beef for bone-less shanks or as osso buco with bone-in. In animation, it is usually the type of beef used to represent any and all types of steak, especially in raw form. ^ Accessed on 25 May 2008.